The name Ohio comes from the Iroquois Indian word for "good river". Ohio was the first state to be carved out of the Northwest Territory, the large section of land in the [gl] Region, which was ceded to the infant United States of America in the aftermath of its birth as an independent nation. It was the 17th state admitted to the Union, in 1803, and its 44,828 square miles makes it the 34th in area. Ohio's major cities dot the state at key points. 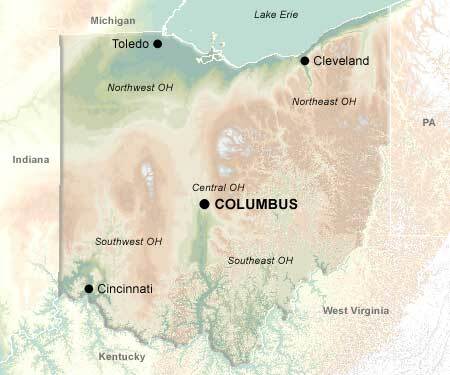 Columbus, the capital, is at the state's geographical center. Cleveland is the major city in the northeast. Cincinnati, in the southwest, is the largest metropolitan area, and Toledo, in the northwest, is a major port on [le]. Ohio is the birthplace of many prominent people. Among those born in Ohio are seven U.S. presidents, astronauts John Glenn and Neil Armstrong, authors James Thurber, Zane Grey, Arthur Schlesinger and Ambrose Bierce, inventors Thomas Edison and Orville Wright, and movie personalities, Clark Gable, Tyrone Power, Steven Spielberg, Paul Newman, Dorothy Dandridge, Ruby Dee, and Lillian Gish, to name a few.